Noctis Lucis Caelum (ノクティス・ルシス・チェラム, Nokutisu Rushisu Cheramu), "Noct" (ノクト, Nokuto) for short, is a fictional character from Square Enix's Final Fantasy series. He is a playable character and main protagonist of Final Fantasy XV, originally a spin-off titled Final Fantasy Versus XIII. The crown prince and protector of Lucis, Noctis and his allies must defend their country when the empire of Niflheim attacks Lucis in an attempt to take control of its magical Crystal. Alongside Final Fantasy XV, Noctis has appeared in the game's expanded media, including Final Fantasy crossover titles, and other game titles including Puzzle & Dragons and the fighting game Tekken 7. Noctis wielding the Engine Blade. Noctis was created and co-designed by Tetsuya Nomura, with later design revisions being handled by Yusuke Naora. Nomura created Noctis as a type of protagonist not featured in a leading role in the Final Fantasy series before. He also wanted his personality to be unique in the series, being unlike protagonists like Squall Leonhart or Cloud Strife, instead focusing more on realism. Noctis' clothes were designed by Hiromu Takahara, lead designer for Japanese fashion house Roen. His clothing was created to be both asymmetric, mirroring the fashion house's trademark style, and indicative of the game's themes and atmosphere. Before his design was finalized, Noctis was given a story-inspired temporary outfit used in early trailers. Since his original reveal, Noctis has been compared with other asocial characters seen in the series' other games based on his appearance. Following the release of the game, Noctis has been positively received by journalists, with many noting his growth over the course of the story, and contrasting him against other Final Fantasy protagonists. His appearances in both the expanded media of Final Fantasy XV and other games have gathered multiple types of responses. Noctis Lucis Caelum is the only son and heir of King Regis Lucis Caelum CXIII of Lucis; the Caelum dynasty safeguards the Crystal, a divine artifact connected to the world's deities. When he was five years old, Noctis was chosen by the Crystal as the "True King", a prophesied figure who would purge Eos of the Starscourge, a plague that will trigger eternal darkness on Eos and turns living things into monstrous Daemons. At eight years old, Noctis is attacked by a Daemon and is sent to the nation of Tenebrae for healing, where he meets and bonds with the nation's princess Lunafreya Nox Fleuret. However, Noctis and Regis are forced to flee Tenebrae when it is attacked by the Niflheim Empire. By the events of Final Fantasy XV, Lucis is under siege from Niflheim, and Regis agrees to a ceasefire. As part of the treaty, Noctis is to marry Lunafreya, and Regis dispatches him to Altissia where they are to be married. Following Noctis' departure, Niflheim attacks Lucis' capital Insomnia, steals the Crystal and kills Regis. Noctis—together with his three companions and sworn protectors Gladiolus Amicitia, Prompto Argentum and Ignis Scientia—sets out on a quest to retrieve the Crystal and defeat Niflheim. To fulfill his role, Noctis collects the Royal Arms, weapons of the ancient Lucian monarchs, from tombs across Lucis. He also gains the aid of the Astrals, divine beings who granted the Crystal to the Lucian line—he is in turn aided by Lunafreya, her attendant Gentiana, and Niflheim's chancellor Ardyn Izunia. Ardyn is later revealed to be Ardyn Lucis Caelum, the immortal older brother of Noctis's ancestor Somnus who swore revenge on both the Crystal and Somnus's bloodline because they demonized him for taking the taking the Starscourge into his body to heal the infected. Noctis gains the favor of the Astrals Titan and Ramuh, but when he finally reaches Altissia and Lunafreya awakens the Astral Leviathan, Niflheim attacks and Ardyn mortally wounds Lunafreya, disrupting the ritual. With her last strength, she helps Noctis subdue Leviathan before giving him the Ring of the Lucii, an artifact through which he can access the Crystal's magic. Noctis then heads for Niflheim's capital of Gralea, burdened by the loss of Lunafreya and tormented by Ardyn. Arriving in Gralea to find its population turned into Daemons, Noctis finds and is pulled into the Crystal. Noctis learns from the Astral Bahamut of Providence, a power borne from the Crystal, the Royal Arms and the Ring of the Lucii capable of destroying the Starscourge forever, the price of wielding it being Noctis's own life. Waking up ten years later, Noctis reunites with his companions as they travel to Insomnia where they defeat the rogue Astral Ifrit and the enslaved Lucii before facing Ardyn. After defeating Ardyn in the physical world, Noctis sacrifices himself to fulfill his role as the True King by purging the Starscourge with the Lucii helping him completely destroy Ardyn's spirit. In the game's post-credit scenes, having confessed his feelings for his friends during a rest before the final battle, Noctis reunites with Lunafreya in the afterlife. Noctis is one of the main characters in Brotherhood: Final Fantasy XV, an anime following his early journey and how his companions came to travel with him. In the opening and concluding episodes, Noctis learns of the fall of Lucis and faces the Daemon that nearly killed him in his youth. Initially helpless against it, he draws strength from his friends and the memories of his father to kill the Daemon. Noctis also made a brief appearance in the CGI movie Kingsglaive, as a young child in a wheelchair. Noctis would have been the central character of a future downloadable content (DLC) episode Episode Noctis: The Final Strike, the finale of a planned tetralogy of DLC episodes dubbed Dawn of the Future. Aside from the first planned instalment Episode Ardyn, all other episodes were cancelled. A Play Arts Kai figurine of him has also been developed. Outside Final Fantasy, Noctis also appears as a DLC character in Namco's fighting game Tekken 7 as a friend of Lars Alexandersson. Lars' voice actor, Junichi Suwabe, enjoyed the interactions between both Lars and Noctis. Tekken producer Katsuhiro Harada commented it was his idea to include Noctis within the game as he was surprised by Final Fantasy XV as well as the coincidence that game from the franchise was released closely with Tekken 7. Additionally, Harada wanted to surprise fans by grabbing an RPG character by adding it to a fighting game and thus had multiple interactions with Hajime Tabata in order to get the permission to feature him in Namco's game. In the making of the character, the developers wanted Noctis to emulate his techniques from Final Fantasy XV with their own hardware. He was created to be accessible to newcomers of the Tekken franchise. Nevertheless, they received a model to follow by Square Enix. However, one technique was based on Lars' Lightning Screw which resulted into their relationship in the DLC trailer. Besides Noctis' regular costume, he wears one hooded entirely created by the Namco staff. The others were created by Square Enix. Noctis was featured in a collaboration with Puzzle & Dragons. He appears in Itadaki Street: Dragon Quest and Final Fantasy 30th Anniversary, and also appears as a playable character in the mobile RPG, Final Fantasy Brave Exvius, and the crossover fighting game Dissidia Final Fantasy NT. Noctis is also the main character of the manga adaptation of Final Fantasy XV. Noctis was parodied by Bkub Okawa, author of the comedy manga Pop Team Epic alongside Ignis as both characters received super deformed designs that parodied the two main characters from that series. Noctis as he appears in the first trailer for Final Fantasy Versus XIII, showing his placeholder design. Noctis was created and designed by Tetsuya Nomura, the original director of Final Fantasy XV, originally a spin-off titled Final Fantasy Versus XIII. Nomura did not want Noctis to look strong, instead being used more to communicate the darkness in the story, which caused some difficulties for the team. His full name loosely translates from Latin into "Light of [the] Night Sky"; his nickname, Noct, translates as "of the Night". Noctis's name was not going to be based on the sky or weather, as with previous protagonists designed by Nomura. After Lightning, the main protagonist of Final Fantasy XIII, was given a weather-based name, Nomura gave Noctis his current name. This name was also a reference to Sora, the main protagonist of the Kingdom Hearts series; Sora and Caelum both mean "sky" in their respective languages, and Nomura considered Noctis to be his latest "son". Noctis' adult appearance was designed by art co-director Yusuke Naora. A major departure from Noctis' character in contrast to previous Japanese role-playing games' protagonists was his aging across Final Fantasy XV. Despite fears of how it would be received by fans, the Square Enix staff decided to make this change. Tabata further elaborated that it "felt that it was important in communicating [the party's] development and wanting to express it in a way that we only can with the current generation of consoles." When creating the development of Noctis' facial features over time, the team drew from pictures of war veterans and actors to add finer details to help mature the character's expression. They also designed Noctis' features so they would hold similarities to Regis, reflecting the game's theme of the father-son relationship. While the game changed names, platforms and eventually directors, Nomura worked with new director Hajime Tabata to ensure that Noctis remained as unchanged as possible in the final product. Alterations and adjustments made to his character model were supervised by Naora. The main goal was to make Noctis appear more realistic: his skin texture was enhanced and subtleties added to its depiction and the effect of different lighting on it, in addition to adding elements such as subtle birthmarks and skin blotches. One of the major goals was keeping the same character impression while making adjustments and enhancements, as series fans already had a concept of who the character was. His hair's shadow effects needed to be adjusted after the upgrade in technology so they did not cast too much shade on his face, but the hairstyle itself was kept consistent. His hairstyle was meant to give two impressions to the player: from the front it was ordered, while from the rear it looked wild. In order to make his hair movements realistic, the team worked with a professional hairstylist to create the design using a mannequin's wig, then used the Luminous Studio engine to render it in real-time. The technique was originally used for the characters in the engine's 2012 tech demo Agni's Philosophy. The character's clothing was designed by Hiromu Takahara, the main designer at Japanese fashion house Roen. Takahara's key inspiration for the style and coloring of the clothing was "jet black", which was meant to exemplify and be representative of the game's atmosphere. In addition, Takahara designed the outfit along the same lines as the asymmetric designs common to Roen's clothing lines. His outfit was designed to make Noctis look like someone who went to a high-class pub. Unlike previous Final Fantasy protagonists, a real set of Noctis' clothes was created by Roen and kept in the office for reference by the development staff: this was due to previous experiences when Nomura had been constantly asked what materials his characters' outfits were made of by the graphics teams. An aspect of his design central to the story was a ring he wore on his right hand, while the gloves he wore were simply for "design purposes". Noctis's outfit when the game was first revealed was a temporary one used while his final look was being created. It was based on the game's script to give a visual impression in trailers. Takahara also designed a formal suit worn by the character in the original opening section of the game. All Roen designs, including Noctis' suit, were retained when Versus XIII was rebranded as Final Fantasy XV as the team felt wrong about removing them despite the other changes. While originally one of four controllable characters in Versus XIII, Noctis is the sole playable character in XV. He is also the only character who can use summoned monsters, recurring elements in the Final Fantasy series. 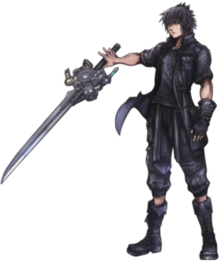 As shown in the conceptual trailer from the 2013 Electronic Entertainment Expo and the final game, Noctis has the power to manipulate multiple weapons at once; his Limit Break "Armiger" further enables him to summon crystalline weapons known as "Royal Arms" into battle. In the story, these powers are passed down through the royal line of Lucis. During an earlier stage of development, Noctis was to have been the only character in the world of XV that could use magic for story-related reasons. As this would not have worked from a gameplay standpoint, the team engineered it so Noctis' companions could share Noctis' magic abilities. During certain points during both story scenes and gameplay, Noctis' eyes turn from their natural blue color to red. This feature was present in both Versus XIII and XV. Nomura did not want Noctis to have a personality like Squall Leonhart or Cloud Strife, the respective protagonists of Final Fantasy VIII and VII, defining their personality type as that of "a silent, gloomy little boy". Instead, Nomura wanted to create a realistic character type not seen in the Final Fantasy series before. Because of this, he was wary about him as he was so new to the series that he might fall "out of bounds". Whereas previous protagonists did not have strong personalities to avoid interfering with player empathy, Nomura wanted Noctis to have "an overabundance of idiosyncrasy", which was one of the ways he would leave an impression on the player. Nomura also wanted the character to have traits and perform actions that bore both heroic and villainous traits, creating someone akin to an anti-hero. He thought that these qualities would match the game's themes very well. While naturally shy, Noctis hides this under a cold exterior, though his close friends can see through this. A key scene that demonstrated his personality in Versus XIII was his first meeting with Stella Nox Fleuret, the original heroine of Final Fantasy Versus XIII. According to Tabata, Noctis' cool mannerisms and reserved exterior stem from his lonely childhood, in addition to a fear of losing those closest to him. His words and actions stem from a fear of disappointing those around him, causing him to work to both fulfill expectations and bring people happiness as a result. When comparing the personalities of Noctis and Lunafreya, Tabata referred to Noctis as the weaker of the two, remarking that he is the one who needs protection instead of her. A key part of his narrative is Noctis' transition from prince to king during his journey. According to scenario writer Saori Itamuro, Noctis faces the future as king with both dread and acceptance as he was brought up to expect such an event. This part of his story influenced aspects of his appearance. Noctis is voiced in Japanese by Tatsuhisa Suzuki as an adult, and by Miyuki Satō as a child. Suzuki was cast in 2009, seven years prior to the game's final release and when the project was still titled Final Fantasy Versus XIII. When he was first voicing the character, Suzuki said Noctis was far more introverted, speaking with a gruff manner and showing little sympathy for those beyond his immediate circle. When the change was made to Final Fantasy XV, Suzuki worked with the production team to create a new persona for the character, who became more outgoing and emotional. For the final game, Suzuki recorded his lines together with the rest of the central cast. To aid his performance, Suzuki modeled it on the stage mannerisms of Kurt Cobain, lead singer of the grunge band Nirvana. While he did not do continuous work on the game due to the game development's "twists and turns", he found himself constantly keeping the character in mind so he could easily portray him when it was time to record voicework for the game. According to Suzuki, some of the recording work he did for Versus XIII survived and was incorporated into Final Fantasy XV. When voicing the character for Brotherhood, Suzuki—who had established a good rapport with the main cast—talked with them about how to shift their portrayals for the altered storytelling medium. For the English localization, Noctis is voiced by Ray Chase as an adult, and by Hyrum Hansen as a child. Localization lead writer Dan Inoue's English interpretation of the character was based by Suzuki's own influence. Speaking about his role, Chase was told that rather than create an English version of the Japanese performance outside a few select scenes, Chase was told to make a performance that would resonate with Western audiences. This resulted in Noctis' English version being noticeably different from the Japanese. If anything seemed wrong, localization directors Inoue and Keythe Farley would call either Chase or someone else in to re-record lines of dialogue. Noctis was not only Chase's first Final Fantasy character, but his first major role in a video game project. He was initially shocked when he received the call that he would be voicing Noctis. Group recording efforts were discontinued due to the need to roughly match the English dialogue to precisely match timing for the Japanese performances. Only one scene was recorded with several English actors together: the opening scene of the game, where Noctis sets out on his journey. English voice work was included for Episode Duscae, but it was cut close in terms of production scheduling. During the ROM checking stage, Tabata saw that the performance was wrong for the character, a feeling reflected in player feedback after the demo's release. As it was too late to re-record, the performance was carried into the demo. Tabata commented that the original performance made the character sound too old, comparing it to Batman. After release, the voice work was redone to show the character's youth and charm, along with his "sense of ennui". Due to the feedback from Episode Duscae, the staff considered recasting Noctis's role, but instead Chase worked with the localization team to find a different voice for Noctis. After putting together a demo reel of Chase performing a variety of lines, Tabata listened and picked the one he thought best suited for the character. The most emotional part of the original recording for Chase was Noctis's final farewell to his comrades during a post-credit scene, which for Chase also symbolized saying goodbye to the localization team. A piece of late-game dialogue that needed re-recording was during Noctis's scene on the throne of Lucis at the end of the game; Noctis initially sounded on the point of tears, but the performance was redone to emphasise his resolve. Video games publications have commented on Noctis' character. Once Final Fantasy XV was revealed to the audience, Todd Ciolek from Anime News Network said that Noctis was "your standard-issue brash anime kid in demeanor." Daniella Lucas from GamesRadar compared him with Final Fantasy VIII's main character, Squall Leonhart, based on his rebellious attitude as he lives "by his own rules" in contrast to the strict code of conduct set by his royal overseers. Similarly, Michelle Nguyen from Geek initially noted physical and mental similarities between Noctis and Naruto's anti-hero and antisocial character, Sasuke Uchiha. However, she found Noctis was nicer but had a heavy burden that made him look cold. Nguyen praised the way Noctis became friends with the other characters. Like Nguyen, David Roberts from GamesRadar enjoyed Noctis' role in Brotherhood due to the way he develops to his relationships with his friends. Andrew Webster from The Verse noted while the characters appear to be cliche, the way Noctis became friends with them gave him a wish to play Final Fantasy XV and see how more do they develop. In an early preview of the game's demo Episode Duscae, GameSpot's Alexa Ray Corriae praised the interactions between Noctis and his companions, citing them as a good example of deep platonic love between men. In a review of Brotherhood's first episode, Meghan Sullivan from IGN also praised the interactions between the main characters, particularly finding comical how Noctis removed parts from his hamburger and this being discussed by his friends as whether or not they were spoiling him. Similarly, Destructoid's Chris Carter became attached to Noctis and his friends ever since the Brotherhood series and expects more from the video game. A fragrance was created in the character's image. There has been an internet meme focused on Noctis and his friends in the Regalia looking at photoshopped images. Square Enix producer Shinji Hashimoto found it comical and motivated fans to produce more in order to increase people's interest in Final Fantasy XV. Following the game's release, Dustin Bailey from Anime News Network praised the interactions between Noctis and his friends, commenting on "Noctis' brooding silence" to the point some scenes felt realistic. Carter shared similar points of comparing Noctis and his allies to the cast of Final Fantasy VI, a highly acclaimed title of the franchise. However, despite also agreeing with Bailey, Carter commented on the reason of how overpowered is Noctis which seemed "hokey". While agreeing with other reviewers regarding the appeal of Noctis and his allies, Philip Kollar from Polygon highly praised the ending Square gave to them in the game without spoiling too much to new gamers. Game Informer writer Andrew Reiner referred to Noctis as a "great leader" as well as "an interesting, conflicted character, torn between his duties to the kingdom and wanting a different life". Noctis has been seen as a "apathethic" in the trailers before the game's release by Becky Cunningham from Cheat Code Central. However, the reviewer found Noctis' characterization in Final Fantasy XV's actual title more enjoyable than in the previous trailers. Despite criticising some parts about the story such as the lack of explanation about Noctis not wanting to take over his kingdom, EGMNOW's Mollie L. Patterson praised how the character grew up alongside his adult design. In a Famitsu poll from 2017, Noctis was voted as the top most wanted character fans expect to be featured in another Square Enix's franchise, Kingdom Hearts. Noctis' inclusion in the fighting game Tekken 7 as downloadable content earned multiple reactions. Rock, Paper, Shotgun found him fitting based on Noctis' and the rest of the cast's skills, and joked about his relationship with Tekken character Lars. Kotaku noted that the crowd of fans cheered for him when he was first announced. Engadget found his inclusion typical of Final Fantasy characters similar to Cloud when he was added to Super Smash Bros., despite finding it unfitting. Similarly, PCGamer compared Noctis' inclusion to the Teenage Mutant Ninja Turtles appearing in another fighting game, Injustice 2, as Noctis did not originate from another fighting game like other guest characters.Writer from Kotaku agreed, with the latter addressing multiple complaints regarding how the fans wanted Kazuma Kiryu from Yakuza as a guest character instead. While finding this surprising, and stating there was "no logical justification", Sam Prell for Gamesradar wrote that fans might enjoy the addition of Noctis to Tekken 7, jokingly commenting that the only similarities between Noctis and Tekken characters were their hairstyles. Similarly, Den of Geek was curious about Noctis' fighting style in the game based on his fighting style, which appeared to combine hand-to-hand combat with magic techniques, making him based on "hit 'em with something sharp". ^ a b c d e f "Behind the Voice Actors - Voices of Noctis Lucis Caelum". Behind the Voice Actors. Retrieved 2014-09-27. ^ Square Enix (29 November 2016). Final Fantasy XV. Scene: Closing credits. ^ 今週のスクープ ファイナルファンタジーXV. Weekly Famitsu. Enterbrain (1281): 11ff. 20 June 2013. ^ Square Enix (9 July 2016). Kingsglaive: Final Fantasy XV Promotional Art Book Program (in Japanese). Square Enix. p. 16-17. ^ Final Fantasy XV: The Complete Official Guide Collector's Edition. Piggyback Interactive. 29 November 2016. pp. 318–319. ISBN 1-9110-1500-1. ^ a b "『ファイナルファンタジーXV』野村哲也氏インタビュー完全版＆画面写真も一挙公開". Famitsu. 24 June 2013. Archived from the original on 13 February 2014. Retrieved 2014-08-16. ^ Romano, Sal (5 August 2015). "Final Fantasy XV at Gamescom 2015: early story detailed, Malboro battle footage". Gematsu. Archived from the original on 6 August 2015. Retrieved 2015-08-05. ^ Square Enix (29 November 2016). Final Fantasy XV. PlayStation 4, Xbox One. Square Enix. Level/area: Chapter 2: No Turning Back. ^ a b Square Enix (29 November 2016). Final Fantasy XV. PlayStation 4, Xbox One. Square Enix. Level/area: Chapter 4: Living Legend. ^ a b Square Enix (29 November 2016). Final Fantasy XV. PlayStation 4, Xbox One. Square Enix. Level/area: Chapter 13: Redemption. ^ Square Enix (29 November 2016). Final Fantasy XV. PlayStation 4, Xbox One. Square Enix. Level/area: Chapter 5: Dark Clouds. ^ Square Enix (29 November 2016). Final Fantasy XV. PlayStation 4, Xbox One. Square Enix. Level/area: Chapter 9: Callings. ^ Square Enix (29 November 2016). Final Fantasy XV. PlayStation 4, Xbox One. Square Enix. Level/area: Chapter 10: The Heart of a King. ^ Square Enix (29 November 2016). Final Fantasy XV. PlayStation 4, Xbox One. Square Enix. Level/area: Chapter 11: In the Dark. ^ Square Enix (29 November 2016). Final Fantasy XV. PlayStation 4, Xbox One. Square Enix. Level/area: Chapter 12: End of Days. ^ Square Enix (29 November 2016). Final Fantasy XV. PlayStation 4, Xbox One. Square Enix. Level/area: Chapter 14: Homecoming. ^ "Head-to-head with Hajime Tabata and Takeshi Nozue about FFXV - Making FF Great Again". Famitsu. 7 April 2016. Archived from the original on 8 April 2016. Retrieved 2016-04-08. ^ Square Enix, A-1 Pictures (30 March 2016). Brotherhood Final Fantasy XV - Episode 1: "Before The Storm" (Video) (in Japanese). YouTube. ^ Square Enix, A-1 Pictures (17 September 2016). Brotherhood Final Fantasy XV - Episode 5: "The Warmth of Light" (Video) (in Japanese). Crunchyroll. ^ Romano, Sal (2018-04-06). "Final Fantasy XV four-Episode DLC set 'The Dawn of the Future' and more announced". Gematsu. Archived from the original on 2018-04-07. Retrieved 2018-04-07. ^ Romano, Sal (2018-11-07). "Final Fantasy XV DLCs 'Episode Aranea,' 'Episode Lunafreya,' and 'Episode Noctis' cancelled". Gematsu. Archived from the original on 2018-11-08. Retrieved 2018-11-08. ^ Dyre, Mitch (18 September 2015). "TGS 2015: Final Fantasy XV's Play Arts Figures Are Must-Haves". IGN. Archived from the original on 18 September 2015. Retrieved 2015-09-18. ^ "Tekken 7 Game Adds Final Fantasy XV's Noctis as Playable Character". Anime News Network. November 12, 2017. Retrieved November 13, 2017. ^ Junichi Suwabe [@MY_MUMUR] (November 13, 2017). "鉄拳シリーズで演じているラース・アレクサンダーソンが、ヤツとまさかのコラボです（笑）" (Tweet). Retrieved November 17, 2017 – via Twitter. ^ "Tekken". Tekken. April 4, 2018. ^ "Harada says it's 'safe to expect more' for Tekken 7". TekkenGamer. May 23, 2018. Retrieved May 24, 2018. ^ Sato (14 November 2016). "Noctis And Tifa To Join Puzzle & Dragons' Upcoming Final Fantasy Collaboration". Siliconera. Archived from the original on 14 November 2016. Retrieved 2016-11-14. ^ "New Fortune Street Game Is Getting A Cute Chibi-fied Noctis". Siliconera. 31 January 2017. Retrieved 2017-01-31. ^ "Noctis From Final Fantasy XV Revealed For Dissidia Final Fantasy NT". Siliconera. Retrieved 19 September 2017. ^ "面白すぎてやっぱつれぇわ……『FFXV』唯一の公式アンソロジー発売！" (in Japanese). Kadokawa Shoten. Retrieved 24 August 2017. ^ Kemps, Heidi (April 5, 2018). "This Week in Games: April Foolishness". Anime News Network. Retrieved April 5, 2018. ^ a b Kristine S. (2 June 2006). "An Interview with the People behind Final Fantasy XIII". Qj.net. Archived from the original on 7 July 2007. Retrieved 2006-06-02. ^ a b IGN Staff (22 October 2008). "New Final Fantasy Versus XIII Details". IGN. Archived from the original on 27 December 2014. Retrieved 2014-09-10. ^ a b c "Japan Expo 2013 : Interview with Tetsuya Nomura (ENG)". Finaland. 7 July 2013. Archived from the original on 8 January 2014. Retrieved 2014-02-13. ^ Ashecraft, Brian (10 August 2011). "Hi. My Name Is Noctis, But You Can Call Me Noct". Kotaku. Archived from the original on 27 December 2014. Retrieved 2014-09-12. ^ a b c d 1000号記念スペシャル表紙プロジェクト. Famitsu Weekly (in Japanese). Enterbrain (1001): 42–45. 8 February 2008. ^ "Final Fantasy XV: Unser Interview bei der Gamescom" (in German). JPGames.de. 24 August 2016. Archived from the original on 24 August 2016. Retrieved 2016-08-24. ^ a b Goldfarb, Andrew (6 August 2016). "8 Gorgeous Photos of Final Fantasy XV's Characters". IGN. Archived from the original on 6 August 2016. Retrieved 2016-08-06. ^ Goldfarb, Andrew (2016-09-02). "PAX 2016: Final Fantasy XV's Story Takes Place Over Ten Years". IGN. Archived from the original on 2016-09-02. Retrieved 2016-09-02. ^ a b c Final Fantasy XV: The Complete Official Guide Collector's Edition. Piggyback Interactive. 29 November 2016. p. 320. ISBN 1-9110-1500-1. ^ Romano, Sal; Thomas, James (22 September 2014). "Final Fantasy XV director talks development, open world, combat, demo, and more". Gematsu. Archived from the original on 2 December 2014. Retrieved 2014-09-22. ^ Ashcraft, Brian (19 February 2015). "Why Final Fantasy XV Has Fantastic Hair". Kotaku. Archived from the original on 19 February 2015. Retrieved 2015-02-19. ^ 完全版！　DKΣ3713最新情報総まとめDKΣ3713リポート. Famitsu. 2 August 2008. Archived from the original on 14 February 2014. Retrieved 2014-09-11. ^ a b c d Romano, Sal (6 August 2010). "Final Fantasy Versus XIII – all the details so far". Gematsu. Archived from the original on 1 August 2013. Retrieved 2014-09-11. ^ a b Square Enix Presents: DKΣ3713 Private Party 2008 - 参加者の声. Famitsu PS3. Enterbrain (XIII): 16–19. 22 August 2008. ^ 『FFXIII』など、最新映像続々！ DKΣ3713 Private Party 2008が開催DKΣ3713リポート. Famitsu. 2 August 2008. Archived from the original on 17 April 2015. Retrieved 2015-04-28. ^ Makowaik, André (6 August 2015). "GC 2015: Final Fantasy XV interview with Hajime Tabata". Nova Crystallis. Archived from the original on 7 August 2015. Retrieved 2015-08-08. ^ Gantayat, Anoop (1 February 2011). "Tetsuya Nomura Talks Up Final Fantasy Versus XIII". Andriasang.com. Archived from the original on 5 December 2011. Retrieved 2013-05-09. ^ a b Slayton, Olivia (2 October 2014). "Final Fantasy XV director addresses fan concerns, new gameplay". Gematsu. Archived from the original on 2 October 2014. Retrieved 2014-10-02. ^ Farokhmanesh, Megan (26 December 2014). "Final Fantasy 15 will feature party attacks, summons for Noctis". Polygon. Archived from the original on 19 February 2015. Retrieved 2015-02-19. ^ Romano, Sal (20 February 2015). "Final Fantasy XV: Episode Duscae demo special reveal live stream – full report". Gematsu. Archived from the original on 20 February 2015. Retrieved 2015-02-20. ^ Nakamura, Toshi (20 December 2014). "Final Fantasy XV's Director Breaks Down the Newest Trailer". Kotaku. Archived from the original on 20 December 2014. Retrieved 2014-12-20. ^ 体験版で旅や戦闘, キャンプを楽しもう!. Famitsu Weekly (in Japanese). Enterbrain (1368): 48. 19 February 2015. ^ Smith, Luke (7 June 2006). "FFXIII Interview: Nomura, Kitase, Hashimoto and Toriyama: Compilation of games puts new spin on FF series". 1UP.com. Archived from the original on 18 August 2011. Retrieved 2014-08-25. ^ Gifford, Kevin (22 October 2008). "Tetsuya Nomura Discusses FF Versus XIII Characters". 1UP.com. Archived from the original on 4 September 2015. Retrieved 2014-09-10. ^ Wallace, Kimberley (5 August 2015). "New Story Details from Final Fantasy XV's Director". Game Informer. Archived from the original on 8 August 2015. Retrieved 2015-08-08. ^ Dunning, Jason (4 January 2016). "Final Fantasy XV "At Its Truest" Will Be Shown During the Release Date Announcement in March". PlayStation Lifestyle. Archived from the original on 4 January 2016. Retrieved 2016-01-04. ^ a b ノクティス・ルシス・チェラム役 鈴木 達央 / キャラクター / FINAL FANTASY XV （ファイナルファンタジー15） / SQUARE ENIX (in Japanese). Final Fantasy XV Website. Archived from the original on 17 June 2017. Retrieved 2017-06-17. ^ a b 「ファイナルファンタジーXV」発売！　田畑D「お待たせしました！」 (in Japanese). Game Watch Impress. 29 November 2016. Archived from the original on 29 November 2016. Retrieved 2017-06-17. ^ 『ファイナルファンタジーXV』 インタビュー: 宮野真守と鈴木達央. Famitsu Weekly (in Japanese). Enterbrain (1464). 22 December 2016. ^ a b 【写真追加】ノクト役の鈴木達央さんが登場した『ブラザーフッド FFXV』の最終話先行上映ステージ【TGS 2016】 (in Japanese). Famitsu. 16 September 2016. Archived from the original on 26 January 2017. Retrieved 2017-06-17. ^ a b Minotti, Mike (2 March 2017). "Final Fantasy XV's four friends were inspired by some interesting (fake and real) people". VentureBeat. Archived from the original on 2 March 2017. Retrieved 2017-03-05. ^ a b c Fekete, Bob (22 November 2016). "'Final Fantasy XV' Noctis Voice Actor On Why His Character Isn't Your Average 'Final Fantasy' Protagonist". Digital Times. Archived from the original on 23 November 2016. Retrieved 2017-01-31. ^ a b c Ransbottom, Nicolas (13 January 2017). "Ray Chase Interview". RPGFan. Archived from the original on 31 January 2017. Retrieved 2017-01-31. ^ Romano, Sal (28 April 2015). "Final Fantasy XV feedback live stream full report: Episode Duscae 2.0 coming mid-May". Gematsu. Archived from the original on 28 April 2015. Retrieved 2015-04-28. ^ "October 2017 Interview with Ray Chase". TheLifestream.net. 27 October 2017. Archived from the original on 22 December 2017. Retrieved 22 December 2017. ^ "The X Button Story of the Class". Anime News Network. 26 June 2013. Retrieved 2016-04-30. ^ Lucas, Daniella. "Everything we know about Final Fantasy 15 so far". GamesRadar. Retrieved 2016-04-30. ^ "Brotherhood Final Fantasy XV: The bro-iest bro-ship to ever be bro-nimated". Geek. 8 July 2016. Retrieved 2016-11-03. ^ "The Kingsglaive movie gives me hope for Final Fantasy 15". GamesRadar. 22 August 2015. Retrieved 2016-08-25. ^ "You should really be watching the weird and wonderful Final Fantasy XV anime". The Verge. 21 August 2016. Retrieved 2016-11-03. ^ Corriea, Alexa Ray (7 March 2015). "Male Intimacy and Final Fantasy XV". GameSpot. Archived from the original on 8 March 2015. Retrieved 2015-03-08. ^ "Brotherhood Final Fantasy XV Episode 1 Before the Storm Review". IGN. 1 April 2016. Retrieved 2016-04-30. ^ Carter, Chris (19 October 2016). "I played a good chunk of Final Fantasy XV, and it seems fine". Destructoid. Retrieved 2016-10-25. ^ "Noctis from Final Fantasy XV Smells Okay, I Guess". Kotaku. 21 September 2015. Retrieved 2016-04-30. ^ "Final Fantasy XV Director Encourages Fans To Make More Car Memes". Siliconera. 2 October 2014. Retrieved 2016-05-03. ^ Bailey, Dustin (6 December 2016). "Final Fantasy XV PlayStation 4, Xbox One". Anime News Network. Retrieved 2016-12-06. ^ Carter, Chris (28 November 2016). "Review: Final Fantasy XV". Anime News Network. Retrieved 2016-12-06. ^ Kollar, Philip (28 November 2016). "Review: Final Fantasy XV". Polygon. Retrieved 2016-12-06. ^ Reiner, Andrew (28 November 2016). "Final Fantasy XV". Eurogamer. Retrieved 2016-12-07. ^ Cunningham, Becky (28 November 2016). "Final Fantasy XV Review". Cheat Code Central. Retrieved 2016-12-07. ^ Patterson, Mollie L. (6 December 2016). "Final Fantasy XV Review". EGMNOW. Retrieved 2016-12-07. ^ "Noctis Wins Vote For Most Wanted Final Fantasy Character For Kingdom Hearts". Siliconera. 6 April 2017. Retrieved 2017-04-06. ^ "Final Fantasy XV boy Noctis is coming to Tekken 7". Rock, Paper, Shotgun. November 13, 2017. Retrieved November 17, 2017. ^ Fahey, Mike. "Noctis From Final Fantasy XV Is Coming To Tekken 7". Kotaku. Retrieved November 16, 2017. ^ Limb, David (November 14, 2017). "'Final Fantasy XV' hero Noctis heads to 'Tekken 7' next year". EndGadget. Retrieved Nov 16, 2017. ^ "Final Fantasy 15's Noctis announced for Tekken 7 as DLC". EndGadget. November 14, 2017. Retrieved November 16, 2017. ^ "Forget Noctis, Here Are Other Ideas For Tekken 7 Characters". Kotaku. Retrieved November 16, 2017. ^ Sam Prell. "The Turtles are coming to Injustice 2, Noctis is coming to Tekken 7 - what is even happening". GamesRadar. Retrieved November 16, 2017. ^ "Tekken 7: Final Fantasy's XV's Noctis Joins the Roster". Den of Geek. Retrieved December 23, 2017.